Welcome the wee one into the clan! Fits babies and toddlers up to 2 years old. Washable, 100% polyester for sensitive skin; adjustable elastic waistband with a velcro closure for easy on-and-off. Made in the USA! 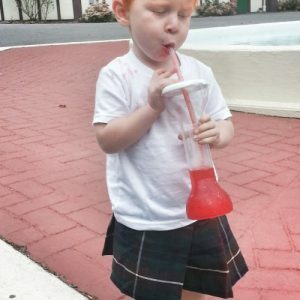 We got our baby boy this kilt to wear to an Irish-themed memorial party, and he was definitely one of the most memorable parts of the evening! 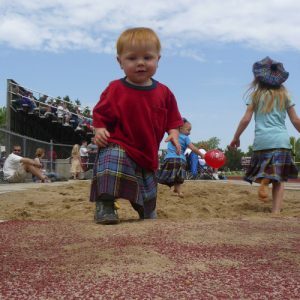 The kilt fit him great, and was nice and secure, plus he never once tried to undo it, so that’s a plus. 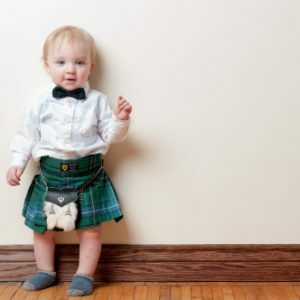 Because of the low price, I had low expectations of the kilt for my one year old. I was pleasantly surprised when I received the kilt in only a few days after ordering (just in time for St. Patrick’s Day – kudos on the prompt shipping). It’s a quality item, ideal for children. It’s easy to fit. There’s plenty of growing room with the velcro strap. Despite rough play, the pleats stay sharp. Well worth the very reasonable investment.